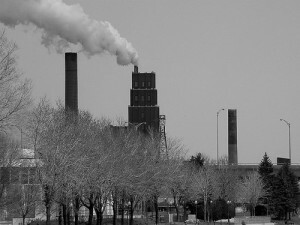 "Pollution" (2008) by Bob August. Licensed under Creative Commons. One of the challenges I confronted while researching my dissertation was figuring out who the founders were of Toronto’s pioneering environmentalist organizations. This might sound like a simple task, but records of this sort are often difficult to find. Sometimes the records that exist present a one-sided story. In Front Row Centre: A Perspective on Life, Politics and the Environment, former alderman Tony O’Donohue makes reference to his founding of the Group Action to Stop Pollution (GASP) in 1967. While O’Donohue makes the organization sound like a solo creation, an ensuing conversation with James Bacque, the former chief editor at Macmillan Company of Canada, lawyer Joseph Sheard, and their spouses led to a claim that GASP’s genesis occurred during a meeting in Sheard’s living room. To the best of their knowledge, O’Donohue was not at this meeting. All of the aforementioned attended the group’s public launch in December 1967. The following month saw the creation of GASP as a legal entity. The accompanying document was signed by Bacque, Sheard, and three others. So, who are the founders? Would it be the people present when the idea of forming an anti-pollution group was first proposed? Would it be the people attached to the organization when it made its public debut? Or would it be the people who signed the group’s legal charter? For some, this may seem trivial. That said, this is a country where a small but vocal segment of the population believes Louis Riel deserves to be recognized as a Father of Confederation, even though he did not attend any one of the Charlottetown, Quebec, or London conferences that led to the creation of Canada. The most evident case of historical revisionism within Canada’s environmentalist community is that of Greenpeace. As it turns out, two of the organization’s former members have seen their status as founders publicly renounced. Greenpeace evolved out of the Don’t Make A Wave Committee (DMAWC), which was created to oppose nuclear testing in the Aleutian Islands. In 1971 a crew supported by DMAWC loaded onto a chartered vessel, the Phyllis Cormack, with the goal of sailing into the test site. Traditionally, members of DMAWC and the environmentalists aboard the Phyllis Cormack have been recognized as Greenpeace’s founders. However, Patrick Moore, one of the latter, has noted that various branches of the organization have written him out of their history. Paul Watson, who was involved in DMAWC as well as the Aleutian campaign as a member of the shore crew, had also been recognized as one of the founders of Greenpeace. However, in recent times Watson, like Moore, has been stripped of this recognition. According to Moore, Greenpeace is distancing itself from him due to his outspoken support for nuclear energy. Watson, on the other hand, was voted off of the Greenpeace board of directors in 1977, and has since then denounced the corporatization of the organization while adopting more radical tactics in his own work. Recognition as founders of Greenpeace, and the credibility this provides, is a valuable commodity for Moore and Watson. However, it appears that Greenpeace wishes to deny this to figures whose views it disagrees with. Who, then, is a founder? The definition is up for debate, and apparently varies from organization to organization. That said, two things are clear. Being a founder has inherent value, and there are people who want to control who receives this recognition. It is the historian’s job to be aware of this and to prevent a Big Brother-styled rewrite of the past. Interesting post Ryan! I’ve run into the same kind of complicated stories while doing my own research. This abundance of founders for a given organization is made trickier by the fact that many 1960s and 70s social movements did not keep extensive records (even meeting minutes), particularly at the beginning. And memories can fade…Looking forward to reading more about Pollution Probe and 1970s environmentalism from you.